Danny: Here we go again, boys. Mugs Malone and the boys go to CCC Camp! 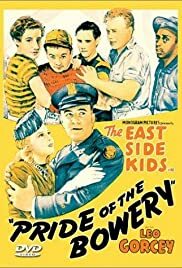 The East Side Boys lived in the poor section of Manhattan in the Lower East Side known as the Bowery. Leo Gorcey leads the cast and the gang as Mugs Malone. When somebody tricks him and the gang to sign up for the Civilian Conservation Corps in the country, he is at first arrogant that he is too good for them. But slowly, he manages to come around. He and the gang work all day with food and shelter provided for them. In exchange, they get to send some money home like $22.00 a month to their families which is a lot of money during the end of the Great Depression. Anyway, Mugs Malone is a good friend and will help out a friend in need. When a friend gets into trouble, Mugs comes to the rescue and boxes to help him out without explanation. This film is part of the East Side Boys film series.